Few days left to the Tee time! Please sign up here!! 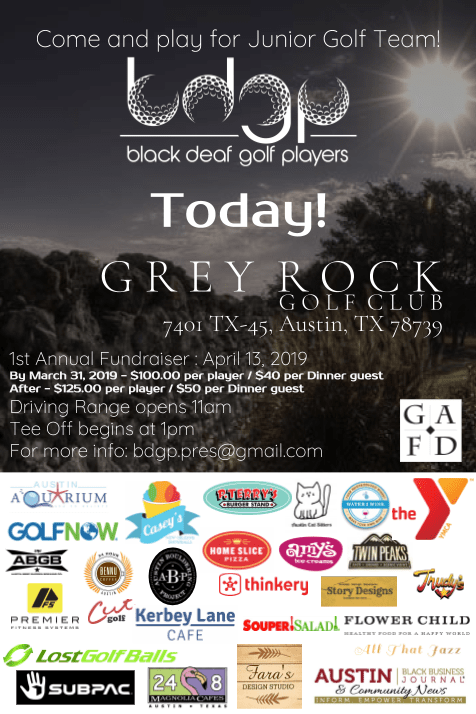 Black deaf golf players’, a 501 (c)(3) non-profit organization, purpose is to create a community of alliance through culture of golf with deaf and hard of hearing adults and children, once challenged by reason of race, economic, & language. we aim to create opportunity for children to benefit this cause. We are seeking support from local, state, and nationwide. black deaf golf players team is working very hard to seek community support, donations, and sponsorships. with continuing support, we are optimistic that at least 70 – 100 people will come to attend our event. our goals are to create safe haven for Deaf, Hard of Hearing, & CODA (Children Of Deaf Adults) children, age 5 – 17, to experience positive personal growth, to have essential equipment and tools to promote positive a lifetime of learning experience, & to establish the only junior golf team for the Deaf, Hard of Hearing & CODA in Austin. We are hosting 1st Fundraiser event on April 13, 2019! How can you support our cause? Here are three ways or all of the ways. Buy a package, or Play around and meet and greet with the community! Sign up to get your spot! Ready to be part of the cause!? Come and sign up! Any questions Cal Balogun at [email protected]!